We're a family run business, so we look after you. 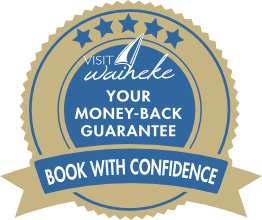 Work with Visit Waiheke who has local experience of the island for over 30 years. A local business with a passion for wine, craft beer and a good understanding of the different arts on the island. Want to know the best fishing spot or go on a wine tour, SUP tour, canoe tour, horse trek or Segway tour ? Book with a local business who has the knowledge you want. I'm looking forward to hearing from you about holiday homes on Waiheke Island.